You are here: Home / North America / United States / Drivers…and Jennifer…Start Your Engines! I’m not a NASCAR fan. Truthfully, I’ve only been to one NASCAR race and that was because Tim got free tickets for volunteering at Phoenix International Raceway. And anything else I know about NASCAR is based on (a probably not very accurate) Talladega Nights: The Ballad of Ricky Bobby. But I like fast cars and really, who wouldn’t want to drive a NASCAR if they had the chance? The Richard Petty Driving Experience lets you do that just: the team puts you behind the wheel of a NASCAR with a right seat ride along instructor helping you rumble around your favorite track every step of the way. Where else better to drive a NASCAR than at Daytona International Speedway, home to the Daytona 500 which is the most prestigious race in NASCAR. Though if you can’t make it to Daytona, you can still get behind the wheel of a NASCAR at more than 20 different tracks across the US. Robert is smiling now…but will he still be smiling after I’ve raced? My poor instructor, Robert, had to deal with me behind the wheel. 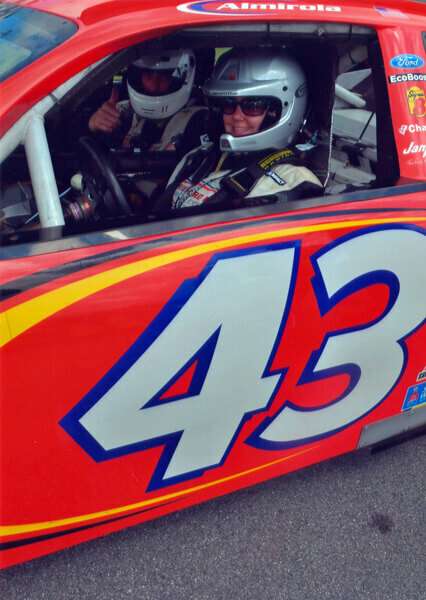 While I had an easier time sliding in through the window in true NASCAR driver fashion than the men revved up about their Richard Petty Driving Experience, I was shaking like a leaf. I was so nervous that I was going to look like a fool, be slower and more cautious than everyone else, or worse yet get in an accident. To top it all off, the Travel Channel was there with a crew filming Anthony Melchiorri drive for an upcoming episode of Hotel Impossible. I definitely couldn’t be the that travel blogger who crashed on the Travel Channel. Robert sensed my nerves right away like the pro that he is and eased my worries. It only took a lap or two and I had the feel of both the track and the car. It’s challenging because the car is designed to pull to the left and if you don’t pull to the right, you find yourself drifting. Daytona also has the third steepest banking in NASCAR at 31° (the banking is so steep that the paving equipment had to be anchored to bulldozers which were anchored to the top of the banking just so they could pave it without rolling down the incline!) Rookie drivers like me want to stay in the middle so you don’t go too high and flip or go too low and flip. Probably much the narrow roads of Italy that it took me a while to get used to driving, the track was much wider than it felt when I was flying around Daytona International Speedway between 130 – 140 MPH. “Let’s give it some more gas,” Robert would encourage me and I’d press down to go just a little quicker. He patiently coached me the entire way guiding me with when to turn, when to accelerate, and when I needed to adjust to the left or right. Though I definitely wouldn’t be beating Colin Braun’s record lap at 0:40.364, my fastest lap was a respectable 1:12.12 at a top speed of 135 MPH (217 KPH). When it was time for my checkered flag and I finally coasted my race car to the white line I started from, I felt great. The nerves were long gone, left somewhere around lap 3 or 4, and I was ready to take on another 8 laps. I felt like I could jump back in and top my fastest lap. But that will have to wait for the next time I get behind the wheel of a NASCAR. Want to see how I really did? Check out this video recorded by the folks at Richard Petty Driving Experience to see me behind the wheel. 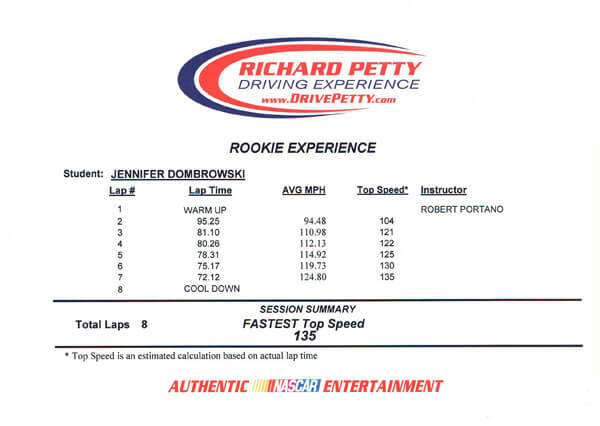 Richard Petty Driving Experience offers both ride along and drive experiences. The Rookie Experience is $449 – $549 depending on the track. You’ll have a better racing experience if you can drive stick shift, though push starts are available for those not experienced with stick shifts. Closed in shoes and socks are required. Race suits, helmets, and safety pieces are provided. If you’re racing in summer, I recommend wearing cool, comfortable clothes underneath your race suit. Shorts are allowed. Photos and your video are available for purchase. There is also a special seating area for friends or family to watch you race and they can bring both cameras and video recorders. Drivers cannot bring video or cameras in to the cars for safety reasons. I was a guest of Richard Petty Driving Experience and all photos and videos were provided in order to bring you this story. As always, all opinions about the racing experience are entirely my own. I’m not a big NASCAR fan. I had an opportunity to do this at a local track many years ago when I was a sports reporter. I was so nervous about the fact that I don’t drive a stick that I passed on the chance to drive, instead choosing to ride with a 16-year-old instructor I was there writing about. Very awesome experience. Maybe I’ll choose to drive next time. I think driving really immerses you in the experience. You feel the pull of the car, the track, and appreciate the level of concentration and skill drivers must have. If you ever have a chance to drive a race car again, definitely do it Lance! Gina your husband would love it! There was a gentleman there the day I drove and his wife had surprised him with the Rookie Experience for his birthday. He was just over the moon and gushing about how this was the best birthday ever. And from the smile on his wife’s face, she was over the moon too that she’d made him so happy.